Often lambasted at the time for either being serious uncool or for false advertising because none of the members had a niece named Sarah, one thing was certain about Ventura, California-based CIRITH UNGOL: They were one of, if not the first, high-intensity hard rock bands from the 70’s who forged their bottom-end heavy SABBATH rhythms with LED ZEPPELIN’s bombastic vocal swagger and mythological lyrics, helping to birth both the doom metal and power metal genre respectively. The legendary lineup of vocalist Tim Baker, guitarists Greg Lindstrom and Jerry Fogle, bassist Michael "Flint" Vujea and drummer Robert Garven boasted four studio albums to their name during their short career before they called it quits in 1991 over a growing dissatisfaction with the music business. Between then and their comeback headlining performance at last October’s Frost And Fire II festival to commemorate the 25th anniversary of their last performance, CIRITH UNGOL not only found that they had that aforementioned festival named after them, but that they were so massively popular in Germany - practically David Hasselhoff level of celebrity stardom minus the red shorts and the talking black Trans Am - that they’ve been slated to perform at the country’s Keep It True festival this coming April 28. So what exactly helped propel CIRITH UNGOL to new heights of popularity outside of their core fanbase, you ask? A sophomore album titled King Of The Dead featuring two mythical warriors ready to do battle Mortal Kombat style on the album cover - and did I mention that one of the warriors is a skeleton? Originally released in July of 1984 and reissued in September 1999, King Of The Dead showcased CIRITH UNGOL’s powerful musical chops as their doom-laden riffs met with their histrionic vocals and cryptic mythical lyrics, producing what the band have always deemed to be their best album. One listen to the solid opening riffs commencing “Atom Smasher” and it’s a promising start for this album. Tim Baker has the perfect voice to compliment Vujea’s thundering bass riffs, while Fogle - left to handle both guitar duties following Greg Lindstrom’s sudden departure during the album’s recording - is one of metal’s most underrated multitaskers of his craft as he gracefully covers the lead and rhythm parts throughout the album. “Black Machine”, “Master Of The Pit” and their namesake may have been in their infancy during the 70’s but their loud-and-proud attitude fits this album like a fine suit. “Death Of The Sun”’s primal thumping bass riff is what Max Webster would sound like if they were a struggling Swedish SABBATH cover band during the 90’s, sounding both retro and fresh for its respected era as Baker’s soaring vocals boost the song towards the stratosphere at 100 km. an hour as the album’s fastest track. Greg Lindstrom makes a brief appearance albeit in spirit as “Finger Of Scorn” stretches past the 8-minute mark in the form of a powerful jam session in parts. Rounding out the rest of the album, the band’s take on Bach’s instrumental “Toccata In D Minor”, originally written as an organ piece, becomes a solid guitar-driven number, and a live rendition of a previously unreleased track, “Last Laugh”, appears as a bonus track once more just as on the original album pressing. The latest reissue of King Of The Dead is a must-have for the most ardent of CIRITH UNGOL fans thanks to the remastering talents of Patrick W. Engel at Temple Of Disharmony. A digipak CD with the finely-tuned tracks is accompanied with a different version of “Death Of The Sun”, taken from Metal Massacre I for the more ambitious-minded fan (though personally I’d skip over this overwrought version after listening to it once), and further followed by three live versions of “Master Of The Pit”, “King Of The Dead” and “Cirith Ungol” recorded live at the band’s comeback show at last year’s Frost And Fire II show at the Majestic Ventura Theater, and a bonus DVD of their incendiary January 1983 performance at the Roxy in Hollywood - a setlist that’s essentially the entire tracklist of King but with “I’m Alive” replacing “Toccata”. 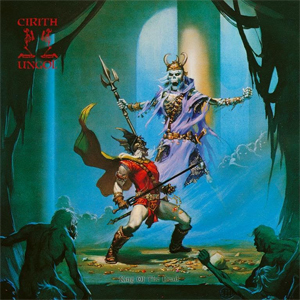 For a band that’s been largely dormant for a quarter century since their last studio release, CIRITH UNGOL have gone above and beyond the call of duty in ensuring that the passage of time hasn’t abandoned them. If anything, King Of The Dead, its generous reissue and the upcoming appearance at Germany’s Keep It True festival in less than three weeks’ time have ensured that it’ll be a challenge to pry the ruling mantle from CIRITH UNGOL’s cold, firm grip. Pick up your copy of King Of The Dead (Ultimate Edition) in the KNAC.COM More Store right HERE.